Video from Oct. 6, 2017 Gala—stay tuned for 2018 Gala Info! We are starting to plan this year’s celebration to be held again in October—stay tuned for additional information! 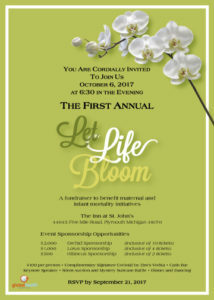 You are invited to Global Health Charities’ first annual “Let Life Bloom” Gala on Fri. Oct. 6th, 2017! 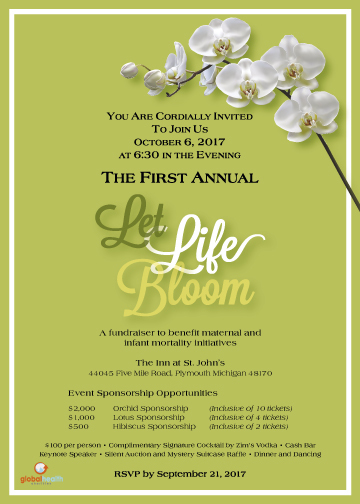 Global Health Charities invites everyone to join us on Friday, October 6th, 2017 at the elegant Inn at St. John’s in Plymouth, Michigan for GHC’s first annual “LET LIFE BLOOM” Gala event! 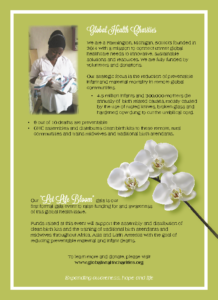 If you or your business would like to gain additional exposure while supporting a great cause–the reduction of neonatal and maternal health in developing countries–join our current sponsors and contact us! We have table and event sponsorships available. We also welcome additional auction items! Presence Health Systems and Kurtz Ambulance CBK Assembly! GHC spent a wonderful day assembling Clean Birth Kits with staff and friends at the Portiuncla Center for Prayer in Frankfurt, IL. The event was made possible by a generous donation from Presence Health Systems and Kurtz Ambulance, a combined gift that funded 1,200 kits. Not only did both organizations donate, they joined us to assemble kits! Franciscan Sisters from Brazil were also there to help us assemble, and will be personally delivering half of the kits in the Amazon region of Brazil this summer. What an uplifting day! MANY thanks to all who were involved in making this event come to life! Join us on May 5th, 2017! 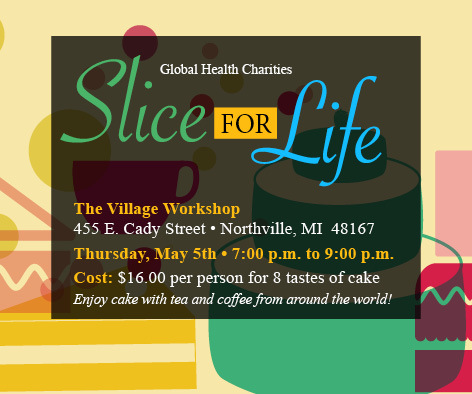 Join Global Health Charities on International Midwives Day on Thurs, May 5th, 2017 at our SLICE FOR LIFE FUNDRAISER at The Village Workshop in Northville, MI! From 7-9 pm, for only $16, come sample cake from the area’s tastiest bakeries as they showcase their talents for a great cause. You’ll also enjoy coffees and teas from around the world and try for great raffle prizes! If interested in attending, please see the application form below. Simply print, fill out and mail it to the address noted. 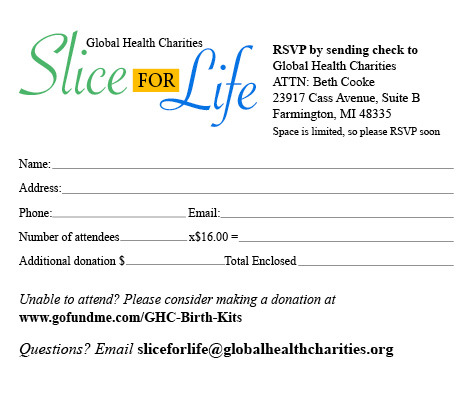 Or email us at sliceforlife@globalhealthcharities.org and we will send you an entry form electronically or by mail. 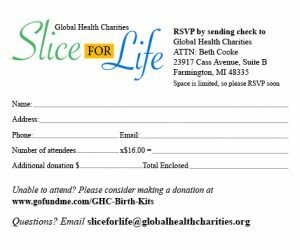 If you cannot make the event in Michigan, please consider making a donation to GHC on this special day celebrating midwives at https://www.gofundme.com/GHC-Birth-Kits! Whew. Our sleep is turned upside down and we still haven’t unpacked, but we’d do it again in a minute. We just returned from a whirlwind two-week trek to Nepal, Myanmar and Vietnam. Of the 12 days we were traveling, we flew 9 of those days. We had a long to-do list, but the following was my favorite. 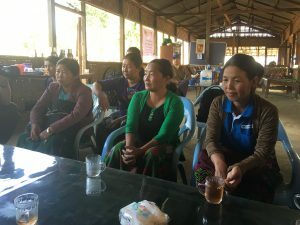 Global Health Charities (GHC) Founder and President, Patricia Williams, along with Vice Chairman of GHC’s Board of Directors, Earl Bridges, Craig Rolan, and I delivered 500 Clean Birth Kits to rural areas in Nepal and Myanmar. In Nepal, we drove 6.5 hours from Kathmandu to deliver 200 kits to Gorkha, which is at the epicenter of the 2015 earthquake. In Myanmar, we flew to Kachin State and delivered 300 kits to traditional birth attendants (TBAs) working in an Internally Displaced Person’s (IDP) Camp. 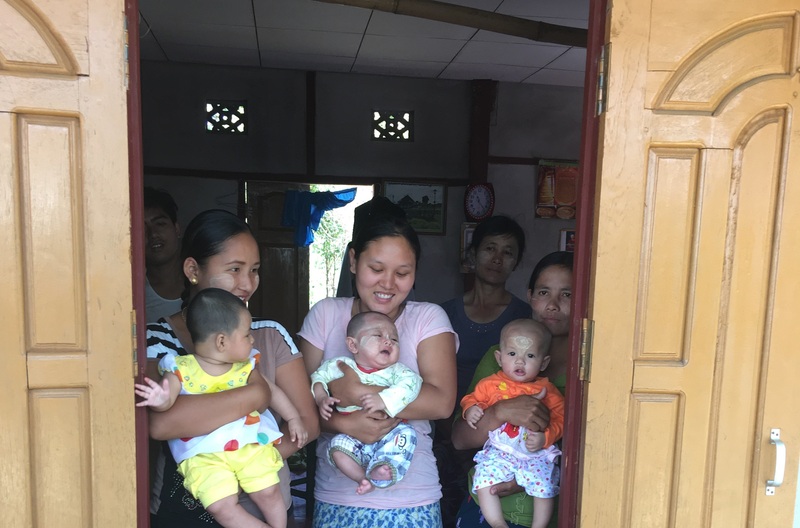 We heard stories from selfless birth attendants about the birth experience in the remote rural area they work in. 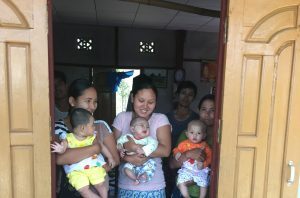 Their stories, many hard to hear, help us press on and look for additional partners and funders who can help us continue our work and support TBA’s, midwives, mothers and their infants. Many people had a hand in donating, assembling and packing the kits we delivered, from religious organizations, to high schools, to companies who donated their time and talents. Without them, we could not have assembled over 1,700 kits since late October and distributed in four countries. We are so very grateful to many generous people, and we are looking forward to expanding this wonderful GHC community in the coming months. Below is a list of items we include in our Global Health Charities (GHC) Clean Birth Kits, as recommended by the World Health Organization (except for the blanket and infant cap—GHC includes those items for warmth and comfort). Six 4” x 8” non-woven cotton gauze pads, or similar size. 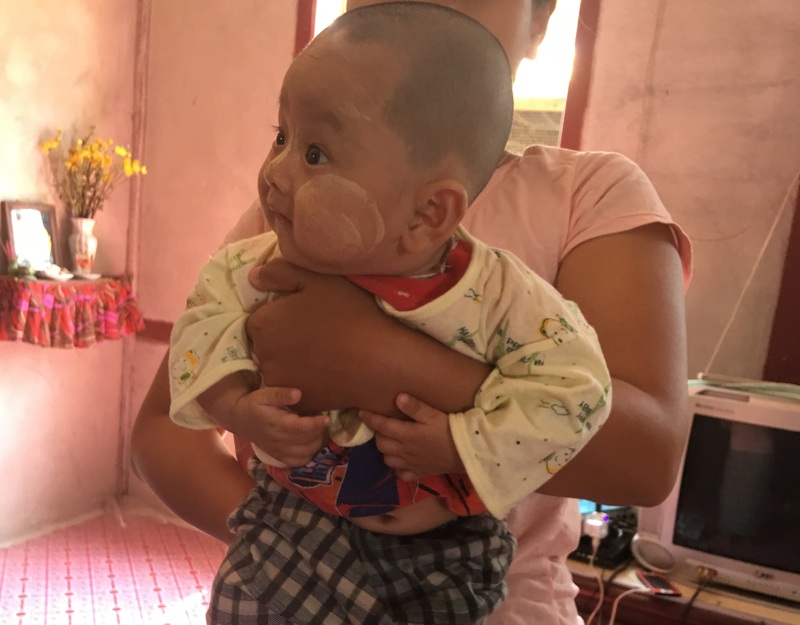 We were told this size is desirable by the Traditional Birth Attendants (TBA’s) we met with in Myanmar. Are you interested in lending a hand or learning more? If you, your company, religious organization or academic institution would like to get involved and/or make us part of your corporate social responsibility program, please contact Susan McAdams at 248-318-9013 or email smcadams@globalhealthcharities.org. One SIMPLE kit can save two lives—mother and baby.